Today, home brewing felt a lot more like work than a hobby. All told, my wife and I sanitized, filled, and capped 12 bombers and 73 standard 11-12 ounce bottles. I labeled 129 bottles, and did the basic layout for six different labels. I cleaned six fermenters, a bottling bucket, a couple of lengths of tubing, several airlocks, and miscellaneous other items. It took most of the day. I have to ask myself "Is it worth it?" What will come out of all this labor? Good Beer: The large batch we bottled today promises to be a really good beer, which clones one of my favorites from BJ's Brewhouse. Assuming that beer turns out well, and taste tests to date have all been positive, I'll have this high gravity Belgian beer to enjoy for months to come. I'll also be able to share it with friends and family who enjoy less-hoppy beers like it. Brewing Experience: Any batch you brew gives you practice and often teaches you something. Depending on how you slice it, today I bottled either two batches - or six batches. One batch was the clone beer above. The other was a low-gravity beer aimed at raising yeast from potentially-dead packages. It was split across five small fermenters, in theory yielding five different beers. Doing these required me to practice adjusting recipes to fit my equipment, brew house efficiency, and overall needs. Knowledge: When the bottles from the five small batches finish conditioning, I will learn how these five yeasts affect the flavor of the beers they ferment. That will help me with future brewing endeavors. I've also learned between the big batch and one of the small ones that Wyeast 3787 is an aggressive fermenter that should always have a blow-off tube available. It made a mess with both airlocks. Yeast: In addition to knowledge and experience, the small batch beers were designed first and foremost to grow the yeast from four expired or nearly-expired packages. Now there should be enough cells available to use in future brewing. 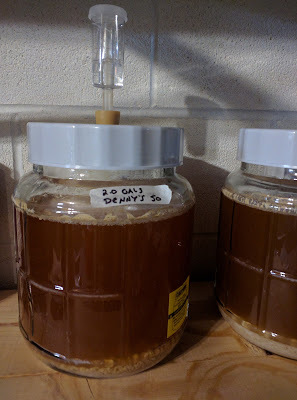 I'll be able to use this "home grown" yeast rather than having to buy new packages. Teaching: It's very likely that I'll share bottles from the "yeast revival" batch with friends who brew their own beer. This will give them the chance to learn how the different yeasts affect beer flavor, meaning that my work will help other brewers, too. Goodwill: It's pretty common for me to share my home brews with co-workers, friends, and family members. This all builds goodwill. Looking over all of this, I guess I would have to say it's been worth it to put in the effort. I'm learning, helping others to learn, enjoying and sharing good beer, and perhaps saving a bit of money on future brewing activities. While taking an inventory of my brewing supplies this week, I noticed that I had five packages of yeast that were older than I realized. One had no date on it at all. Another was past its "best by" date, and the last was over two years old (and I decided to throw it out). Rather than let these yeasts go to waste, I decided I should probably grow them so they'd be usable when I am ready for them. I could do that by mixing up a batch of "Fast Pitch" wort starter from cans and using my stir plate. That would mean spending at least $10 on the cans of starter. I'd have nothing to show for it but the yeast, which would be OK but kind of a waste of time and materials. A good yeast starter wort is typically said to have an Original Gravity (OG) of 1.036 to 1.040. I decided to build a wort recipe with a gravity of 1.040 SG (10.0 Brix) to use as a yeast starter. 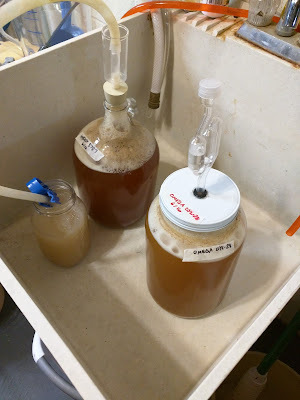 Rather than make a disposable wort that served as a starter and was then tossed out, I decided to use it as an experiment for learning how different yeasts affect a beer's flavor. My goal is for this to turn out a drinkable (albeit weak) beer using different yeasts. Then I'll have those yeasts available for upcoming brew sessions. I decided to start with a mix of 2-row pale, Munich, Vienna, and Caramel malts so there would be some decent underlying malt complexity. It's loosely based on an Oktoberfest formula. That should be compatible with all the yeasts I'm using and is similar enough to the worts I'll eventually use the yeast on to ensure that the yeast can handle them. I decided to use Czech Saaz hops to bitter, flavor, and provide aroma, as they are a noble variety that's used across many beer styles. I also wanted to try a hopping approach that I hear is becoming more popular, which is using late additions to accentuate the hop flavor without adding too much bitterness. I'm timing the hops additions so that the majority of the bitterness comes from late additions. 1 vial White Labs Clarity Ferm spread across all batches. Using the Brewer's Friend Yeast Starter Calculator, I worked out roughly how much yeast remained alive in the containers, and settled on wort volumes that would hopefully grow that yeast to my desired amounts for future brewing. This means that I'll effectively have six beers fermenting in my basement when I'm finished. (I have an IPA and a Belgian Tripel in fermenters already.) That's the most I've ever had going at once! I'll be using 2.5 gallons of mash water treated with half a Campden Tablet to remove chlorine and chloramine and 4.75 gallons of sparge water treated with a Campden Tablet. This should result in a 6.4 gallon pre-boil volume. I used a 60-minute boil schedule, with hops loaded toward the end of the boil to provide more flavor and less bitterness. The goal is a beer that is relatively balanced but not over-hopped given that it's going to be fairly low gravity. So 11.4 IBUs might not sound like a lot to an IPA fan but in a beer with such low gravity that's a BU:GU ratio of 0.282. It should work out to be fairly balanced unless the beer attenuates really well, in which case it'll tend toward the hoppy side. I expect 5.1 gallons of wort, but will be splitting it across several vessels to allow for growing multiple varieties of yeast (as noted earlier). The plan is to let the yeast ferment without any attempt at temperature control. The low ambient temperature in my basement combined with the comparatively small volumes of wort should mean that the temperatures won't rise especially high during fermentation, but that does mean that I'm taking a risk that a given yeast won't overheat and generate off-flavors. Since this is a fairly low gravity wort, that seems unlikely to happen. In the above photo, you see the five fermenters and their wort. The yeasts were all within or near their "best by" dates, except possibly the Omega yeast - which had no easily identifiable date on it. (Since I don't recall when I bought it, it might have no living cells left in it. Any worts that don't show signs of fermentation within 48-72 hours will likely have a similar fresh dry (or liquid) yeast pitched in to ensure that I don't waste the wort. Once they're all fermented and bottle conditioned, I'm planning to do a taste test here to see how one wort with five yeasts can end up with different flavors. Update June 17, 2017: All yeast strains but the Scottish ale strain show activity. The Wyeast 3787 Trappist High Gravity strain was beginning to clog its airlock, so I replaced it with a clean airlock. Within a few minutes I saw yeast accumulating in that one too, so I rigged up a blow off tube (shown below). I also put the Scottish ale yeast on a magnetic stir plate to try to revive it by introducing additional oxygen. If there is no indication of activity tomorrow, I'll consider pitching in another strain like Safale English Ale yeast. Left is the Wyeast 3787 which needed a blow-off tube (plus I moved it to the sink in case there was any overflow). Right is the Omega Labs OYL-028 Belgian Ale W yeast which also has a thick krausen atop it. Update June 18, 2017: Today even the Scottish strain shows a small krausen in the fermenter. It will be interesting to see if, when that portion of wort is finished fermenting, we really have Scottish Ale yeast or something perhaps picked up out of the air. The Wyeast 3787 is still bubbling actively and has turned the previously-clear water in the blow-off vessel a milky beige. The Denny's Favorite 50 yeast shows signs of the yeast beginning to drop out of suspension, as does the Bastogne yeast. The Omega yeast has about an inch and a quarter of krausen on top and seems to be working fine. All five yeasts at this point appear to be alive and well. My plan is for all these yeasts to have at least a full week (preferably two) in the wort before I bottle the beers and harvest the yeast in the fermenters. (Presumably) Edinburgh Ale Yeast, fermenting nicely now. If it's not Edinburgh, then it's an active wild yeast. Wyeast 3787 (left) has blown a good bit of material into the blow-off vessel and changed the liquid from clear to milky. Omega Belgian Ale W on right still fermenting the wort. 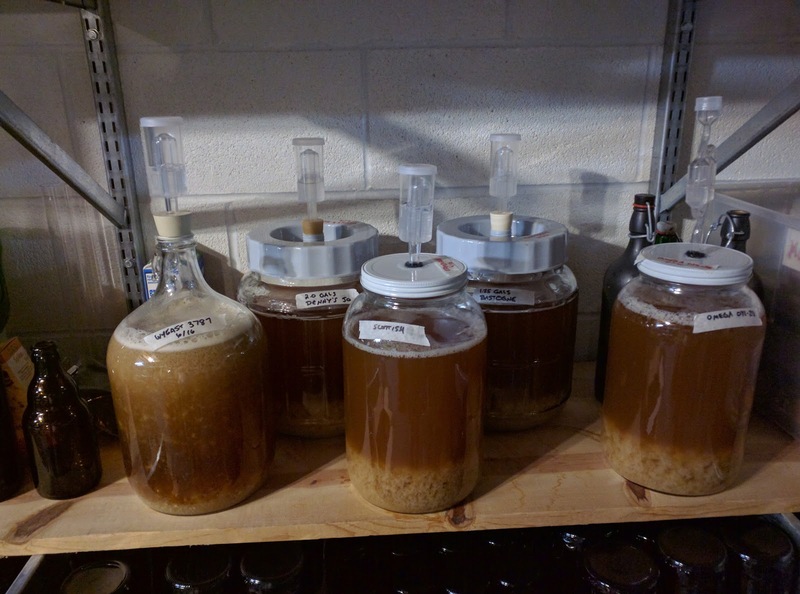 June 20, 2017: The Bastogne, Denny's Favorite 50, and Edinburgh yeasts have mostly settled out of the wort. A wispy layer of foam remains atop the wort and there is no longer any visible airlock activity. The Trappist High Gravity yeast, Omega Belgian Ale W, and Edinburgh yeasts still show some signs of airlock activity. Compared with a couple of days ago, all the fermenter contents are clearer and show little or no motion. This relative lack of activity is consistent with normal, healthy yeast activity. While I was checking on the beer, I took the time to complete the washing of a prior batch of White Labs California Ale yeast from an IPA I made recently, and started washing the yeast I kept from an Australian Sparkling Ale. That yeast was harvested back in April, so it will need to be revived as soon as one of these fermenters becomes available. I anticipate being able to bottle some or all of these beers this coming weekend. June 25, 2017: Virtually all the beers have stopped actively (or at least visibly) fermenting. The fermenters contain very clear-looking beer with little floating on top of them, so I'm concluding that they are probably done fermenting. I bottled all five variants today and harvested the yeast for future use. Some of the beers had small amounts left over after bottling. I tasted those but have to say there wasn't much difference between them. The one with Wyeast 3787 had a bit more of a Belgian flavor to it. The Denny's 50 had no discernible yeast flavors. The Edinburgh Scottish version seemed maybe a little more malty. But the differences are extremely subtle. The experiment yielded 43 bottles at 12 ounces each, divided among the five yeast strains. Yeast has been harvested and placed in cold storage. 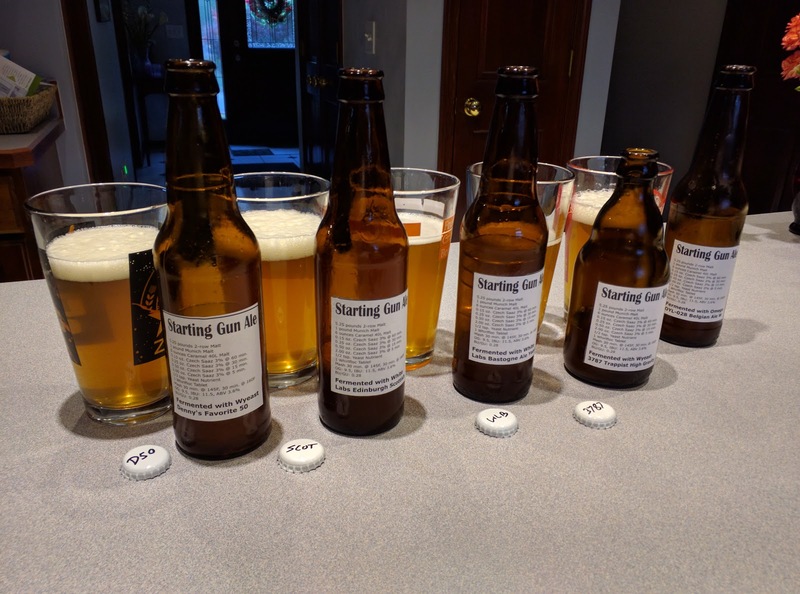 In the photo above, you see the five variants of Starting Gun Ale. From left to right, the version fermented with Wyeast Denny's Favorite 50, White Labs Scottish Edinburgh, White Labs Bastogne, Wyeast 3787 Trappist High Gravity, and Omega Labs Belgian Ale W.
Omega Labs OYL-028 Belgian Ale W Yeast: The aroma is a mix of malt, fruit, and floral notes. The flavor starts and finishes dry. The finish is clean, less bitter than Wyeast Trappist High Gravity, but more than White Labs Bastogne. Compared with the Omega yeast, D50 was more buttery and malty. Omega had a more citrusy and fruity aroma, with more spice to the flavor. D50 was more "basic" in its flavor. Compared with the Omega yeast, the Scottish aroma was milder and malty. The Omega aroma was more fruity. The Scottish yeast yielded a more malty flavor. The Omega yeast had a bit of clove and fruit to the flavor. Compared with OYL-028, Bastogne had a more funky aroma. Bastogne is more Saison like, while OYL-028 is cleaner. The aroma of the Wyeast 3787 beer and the Omega yeast are very similar. The Omega beer might have a bit more clove and spice aroma to it. The Omega beer is more dry and malty, but 3787 seemed less flavorful overall. Wyeast 3787 Trappist High Gravity Yeast: The aroma is fruity and clearly Belgian. The flavor has a hint of sweetness to it, and is malty with a hint of fruit and spice. There is less overall flavor than the Omega yeast. The finish is more hoppy and bitter than the Omega yeast and the Bastogne yeast. Compared with Wyeast 3787, the 3787 strain is more spicy and floral. The Scottish yeast had a much thicker mouthfeel, while 3787 was probably the thinnest. Compared with Wyeast 3787, D50 was cleaner, more neutral, and malty. The 3787 has a more spicy, fruity aroma. The finish of 3787 seemed more bitter. When compared with the Wyeast 3787, Bastogne had a more funky aroma, while the Wyeast had a more fruity aroma. The 3787 flavor was cleaner, not as funky, and the beer seemed to have a thinner mouthfeel. White Labs WLP510 Bastogne Yeast: The aroma is more complex than Wyeast 3787 or the Omega yeast. It has a funky element to it, like a Saison. It has citrus and floral notes to it. The flavor is more fruity and funky than the above two yeasts. Compared with the Bastogne yeast, Bastogne had a more complex aroma. The Scottish aroma was more malty. Bastogne had a more funky, floral, Saison-like aroma. Compared with Bastogne, Denny's 50 had a cleaner aroma and flavor. Bastogne seemed more funky and Saison like, where Denny's seemed more basic - but more sessionable. White Labs WLP028 Scottish Edinburgh Yeast: The aroma is more malty than anything else, with maybe a hint of butterscotch. The flavor is malty, dry, and has a clean finish. It's more malty than Denny's Favorite 50. It seemed to have a more substantial mouthfeel, and its head seemed to last the longest of the five. Compared with the Edinburgh yeast, Denny's Favorite 50 seems to have less malt flavor in the middle of the sip. Denny's seemed to make the hops more noticeable. The Denny's yeast finished more bitter, too. Wyeast 1450 Denny's Favorite 50: There is minimal aroma on this one, compared with the others. What's there is mostly malty with a hint of caramel. The flavor is dry, and comes across more hoppy than the others. There's a hint of diacetyl to it as well, which may mean it needed more conditioning time. Compared with Bastogne, it's a cleaner aroma and flavor. Bastogne seemed more funky and Saison like, where Denny's seemed more basic - but more sessionable. Wyeast 1450 Denny's Favorite 50: For this particular base beer, the Denny's Favorite 50 yeast seemed to make the beer more sessionable and easy to drink. Omega Labs OYL-028 Belgian Ale W Yeast: While I think the Bastogne yeast made a more complex and interesting beer, both in terms of flavor and aroma, I can imagine myself drinking more of the beer made with the Omega yeast. Wyeast 3787 Trappist High Gravity Yeast: This beer came out a bit thinner and less flavorful than the Omega yeast, but still pretty drinkable. White Labs WLP510 Bastogne Yeast: This was probably the most interesting beer in terms of flavor and aroma, but I couldn't imagine myself drinking more than a bottle of it at a time. I'll probably try this yeast when I decide to try brewing a Saison. White Labs WLP028 Scottish Edinburgh Yeast: This yeast produced a fairly boring beer in this case. It was drinkable, and there was nothing really "wrong" with it, but it just didn't impress me in any particular way. I would still use it when brewing a Scottish ale. It's also worth mentioning that the technique of obtaining most of the bittering through late-addition hops yielded an interesting result. While there was plenty of hop flavor to offset the malt, the bitterness seemed "softer" and easier to drink. Although I've been brewing beer for several years now, I never entered any homebrewing competitions. At first, I didn't think my beer was that great. Then when it got better, I felt like I knew enough about what the flaws were that I didn't really need the feedback. This year, I decided to give it a shot. I entered The Ohio State Fair Homebrewing Competition and Barley's 22nd Annual Homebrewing Competition, both held in May 2017. Entering the competition at the Ohio State Fair was relatively painless. You complete an entry form for each beer you intend to submit (up to eight total), pay a $6 entry fee, and then arrange for two bottles of each entry to be delivered to the fairgrounds. I dropped them off on a vacation day since I live in Columbus not too far from the fairgrounds. Entering Barley's competition was also relatively easy. Fill out a BJCP recipe form for each beer and bring three bottles of each entry to their brewpub near the Greater Columbus Convention Center the week before the judging. Judging takes place at their annual Afternoon with the Brewers event, which was held on Sunday, June 4, this year. My main motivation for entering was to get objective feedback on what I was doing right and wrong in my brewing. If I won any competitions, that would be great, but it wasn't so much the goal as to get useful feedback on the recipes and processes. In the months preceding the competitions, I brewed as often as I could. I wound up making six or seven different beers. Two weren't ready in time for competition, so they weren't entered. One barely finished in time (and, I think, suffered in the scoring partially because of that). The results surprise me even now. Of the five beers I entered in competition, three of them took awards. Two of my beers received silver medals in their respective style categories, and another (which didn't medal at the fair) took third place overall at Barley's. That's not bad, I think, for a first-time competitor. There is still much room for improvement, though. Even my winning beers didn't score as high as they could have. Reviewing the feedback for a single beer was interesting. It was clear that the judges don't all view the same beer the same way. One beer was criticized for having "no hops flavor or aroma" by one judge, while another said it was a little too bitter for the style and recommended reducing the hops additions in a re-brew. Like the old saying goes, "you can't please everyone". While the judges differed on what they liked and disliked about the beer, the scores were reasonably close in all cases. I never had (for example) a 23 from one judge and a 40 from another. The scores were generally within 2-4 points of one another. Body: A common complaint on some of my beers was that the body was a bit too thin for the style. My Quadrupel, for example, was described as a medium body. That's a style which shouldn't be thin. This tells me I need to raise mash temperatures. Dryness or Over-attenuation: Going kind of hand-in-hand with the comments on body and mouthfeel, the judges often commented that my beer might be over-attenuated for the style. This points to a need to choose different yeast strains and/or increase mash temperatures. Hopping: Almost every beer I made was criticized by a judge for something related to how it was hopped. This doesn't surprise me. I am simply not a fan of beers with a strong hop presence in the flavor, and I probably under-hop beers as a result. My tastebuds' definition of "balanced" seems to correspond with most judges' definition of "balanced too much toward malt". So be it. If I'm brewing beer for competition, I start increasing the hops load a bit so it scores better - but when I'm brewing for myself, I won't. Oxidation: While only the Australian Sparkling Ale got significant negative comments around oxidation, the judges mentioned "slight" or "possible" oxidation in several of the beers' notes. I'm not totally surprised by this, because I tended to transfer the competition beers from primary to secondary (something I don't often do normally) to clear them up, and again from secondary to bottling bucket. I do this through gravity feeds and plastic tubing between the vessels to reduce oxidation, but lately I've noticed that the tubing doesn't fit snugly on the valve coming from the SS Brewing Technologies fermenters, so it's probably letting in oxygen that it shouldn't be. I've ordered tubing with a smaller inner diameter to enable a tighter fit and less oxygen intake. I'm also going to think about other ways to reduce oxidation. I've actually communicated with one of the judges who described my beer as oxidized and we came to agree that the reason it got that descriptor was most likely that some of my malts are more than six months old. The judge, a professional brewer, said that although maltsters say that malt in an unopened bag is good to store for a year that his experience is that storage for more than six months is probably going to lead to oxidized malt. On the positive side, I'd already recognized an issue with body and thinness in the last couple of high-gravity Belgian beers I'd made. They seemed a bit dry to me and thin. This tells me that my tastebuds are on the right track. If I feel like I've fixed those problems in the future, hopefully the judges would agree. I suspected that a slight off-flavor I've gotten in some of my beers was oxidation, but it never matched (to my tastebuds) the descriptors people have used to describe oxidation. I've never tasted anything that to me seemed "papery" or "wet cardboard like" or "sherry like" in my beer, but I have noticed a flavor that's stronger in beers that were more churned-up during transfers and bottling. That's most likely what I'm sensing. I will probably never agree with most judges on the hops issue. To me, many craft beers on the market are off-balance and tend toward hops. The judges also provided specific feedback on the beers that I'll take to heart when I re-brew those particular recipes. 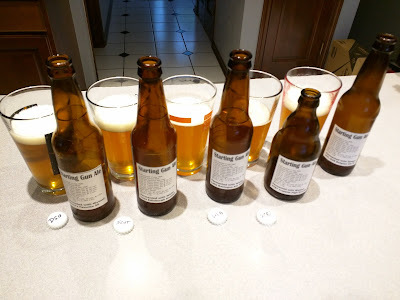 On this web site, I've already updated the pages for those beers to include my plans for the next iteration of the recipes based on the feedback I received and my own tastes. Some time ago I came across a post online where someone set out to clone the Rhinegeist Truth beer. They got feedback from a brewmaster at Rhinegeist about how they formulate the beer and hops additions. Using their feedback, I created the recipe below. Although I'm not an IPA fan, several people I know are, and it's nice to have something to offer them when they visit. It's also appropriate to say that on those rare occasions where I do order an IPA in a bar or restaurant (often because it's all they offer, sadly), Rhinegeist Truth is one of the few I'll intentionally order. The 20 minute addition is 20 IBUs worth of a 2:1 mix of Centennial and Simcoe. I found that the best way to calculate this in BeerSmith was to create a throwaway recipe with 13.44 pounds of grain and put a 20-minute hops addition of Centennial and Simcoe into it. Then I adjusted the amounts of the additions such that it contributed 20 IBUs and was a 2:1 ratio of the two types of hops. The 10 minute addition is 16 IBUs worth of a 2:1 mix of Centennial and Simcoe. I used the same technique as above to calculate the amounts. The final addition is a mix of hops in specific volumes. The notes say to do a hop stand of 45 minutes with the heat off and without any cooling, so that's what I did. The grain amounts above are based on the Rhinegeist brewer's stated grist percentages. Truth uses a simple single-step mash. I used The Grainfather to brew this one, so I began by putting 5.5 gallons of mash water in the kettle and treating it with a Campden tablet. This was heated to 150F and the grain added to it. The grain was mashed for 60 minutes, then heated to a mash out temperature of 170F. 2.8 gallons of sparge water were added, and some additional water added to hit the desired pre-boil volume of 7.4 gallons. My actual pre-boil gravity was 14.3 Brix versus an expected 14.3 Brix, so I came out right on target. The Grainfather was set to begin the boil as I sparged the grain, since it takes a while to heat up. By the time the sparge was finished, the wort had reached a temp in the 196F range. That dropped a bit when I topped it off to 7.4 gallons. 0 minutes; Turn off the heat, add the final hops mix that includes Centennial, Simcoe, and Citra. Leave the kettle alone for 45 minutes, heat off, no chilling. My final gravity registered 16.2 Brix versus an expected 16.1 Brix. Final kettle volume was 6 gallons as anticipated. Volume into the fermenter was only 5.5 gallons due to the massive amount of sediment in the kettle, probably a combination of the hops and grain sediments. These clogged the filter and pump in The Grainfather and prevented all the wort from being sucked out. Given that much of what was left was gray sediment, I chose not to dump that into the fermenter and accepted the loss of a half gallon. The White Labs California Ale Yeast was pitched into the fermenter along with a vial of Clarity Ferm. 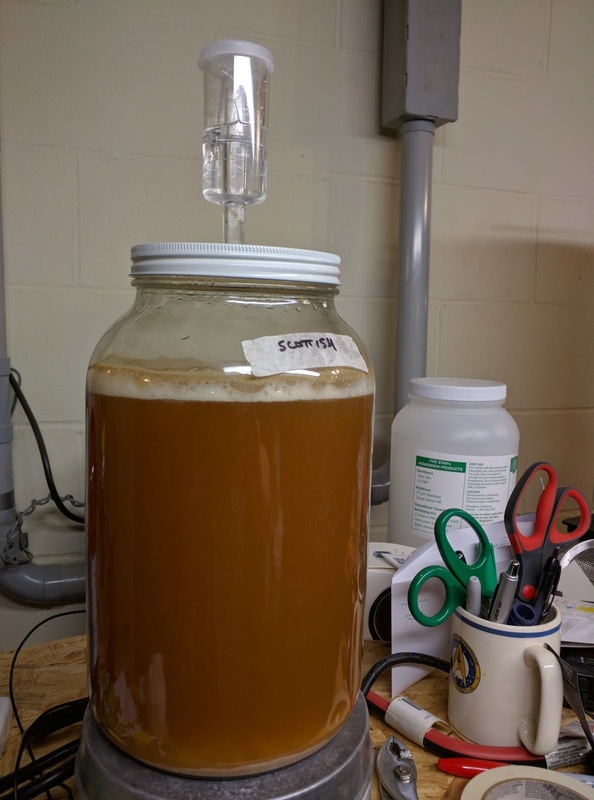 An airlock was inserted into the fermenter. My temperature control system was busy handling a BJ's Millennium Ale clone brewing in another fermenter, so I let the beer sit at ambient basement temps (approximately 69F this time of year) to ferment. When the other beer is past the high stage of fermentation, I'll transfer the chiller to this beer to keep fermentation temps in check. Update 06/14/2017: The beer has completed primary fermentation and has spent an additional 7 days with dry hops in the fermenter. Since the real Truth is a bright beer, I wanted my clone to look just like it. 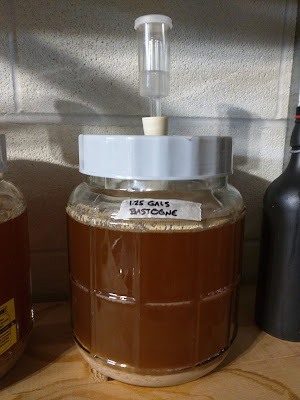 I mixed up some gelatin finings and dropped those in, noting that there is no longer a krausen or any yeast visible on top of the beer now - another indication that fermentation is over. There was a significant hop aroma when I opened the fermenter to put the finings in, so the dry hops are doing their job. I'm expecting to bottle it this Saturday. 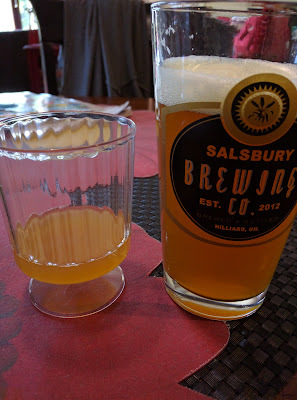 Update 06/16/2017: A family member who is very familiar with the real beer (and had in fact just finished drinking one) was given a sample of the clone. He thought the aroma had been "nailed" and the flavor was a very good match. He thought the clone finished a little more cleanly but otherwise couldn't tell the difference. It will be interesting to see what others think when it's bottle conditioned. The clone beer appears slightly lighter in color than the real beer, but this may be because it's a much smaller volume in the glass (so light can penetrate it more easily and make it appear lighter in color). Given that the clone is not yet carbonated and has only had a little time with its dry hops addition, the two are very similar already. It was difficult to tell the original and clone apart by only the flavor. The clone's aroma is primarily grapefruit at this point, while the real beer's aroma is more intense and varied. This may change as the clone spends more time with its dry hops. I'm looking forward to comparing the two when the clone is finished. June 25, 2017: At least three people who are familiar with the real Rhinegeist Truth IPA have weighed in on this clone. The consensus is that it hits the aroma, bitterness, and flavor notes well. The real Truth has a bit of a harshness in the finish, like an almost astringent hoppy flavor, that my clone is lacking. My clone also finishes more cleanly than the real beer - but the two are extremely close to untrained tastebuds. I'm sure a Rhinegeist brewmaster would identify other things wrong with it... but casual drinkers seem to enjoy it. Yield for the batch was 46 bottles, 10 of which were 22-ounce bombers and the other 36 were 12-ounce bottles. July 25, 2017: I visited Rhinegeist last Saturday, and took their sensory folks a bottle of the beer. They wrote a nice message back today saying "I just got a chance to taste your clone. Well done! 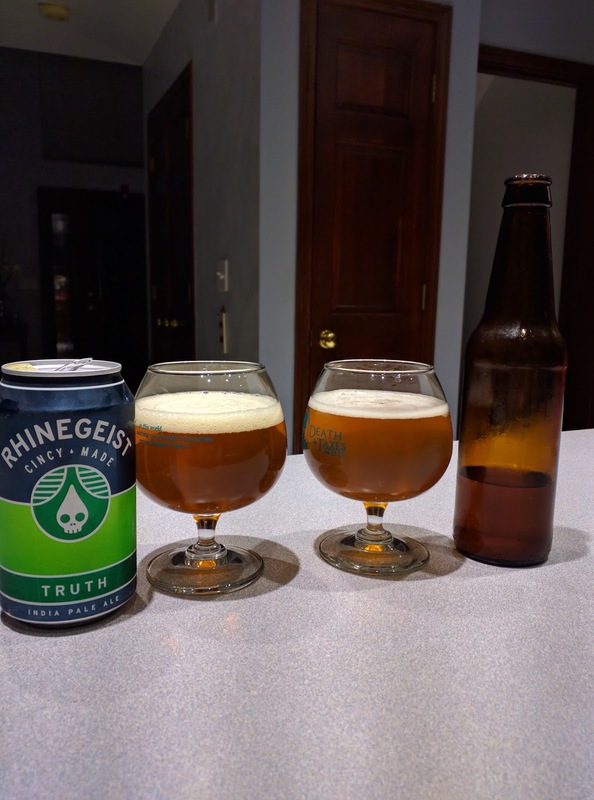 I've tasted a number of Truth clones, and they're usually thin-bodied and way too light in color - you hit both of these attributes very well. The hop profile is also very similar to the real thing, which is another problem I often find in homebrewed clones." It finished with "The consensus from those of us who tasted it was that we'd definitely be proud of it had we homebrewed it ourselves. Again, well done!" I think that's about as high a praise as I could expect for the beer. BYO Magazine posted a clone recipe for BJ's Brewhouse's Millennium Ale. This is a Belgian Tripel brewed with bitter orange peel, orange blossom honey, ginger root, and coriander. They created it to celebrate Y2K and ended up brewing it for several years afterward. 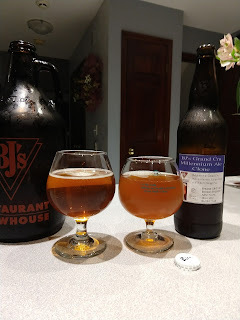 I've always tried to make it a point to get to our local BJ's when they have this, but I've missed it the last year or two, so I decided to brew my own. At right, you see a photo with the actual BJ's brew on the left, purchased in a growler from them the day before the photo was taken, and a glass of the clone on the right. The BYO recipe called for a 60-minute mash at 154F. The Grainfather calculations estimated that I would need 5 gallons of mash water, so I added that to the kettle with a Campden Tablet to remove the chlorine and chloramine from the local tap water. 2 gallons plus 38 ounces of additional water would be used to sparge, and was set to heat slowly while the grain mashed. During and after the boil, the presence of ginger root in the beer was noticeable in the aroma. The BYO recipe calls for a 68-70F fermentation until a final gravity of 1.020 SG is achieved. I set up the temperature control system and got it ready to go. Wort entered the fermenter at approximately 75F after leaving the chiller. Update 06/04/2017: When I checked on fermentation yesterday, the airlock was bubbling nicely. Today, yeast had blown up through the airlock, out the top, and across the lid of the fermenter. 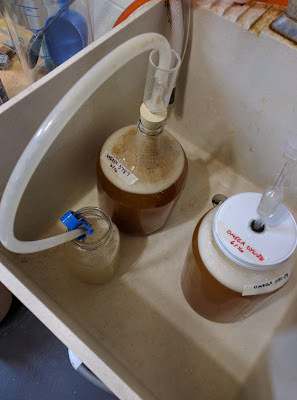 It took a bit to cleanup the yeast and sanitize the top of the fermenter before removing the airlock, which actually hissed when it was removed. I suspect pressure was building up inside the fermenter and could have explosively blasted the airlock out had I not checked on the beer this morning. I will check on it again in a few hours to ensure that things are back under control again. If you make this beer in anything less than an 8-gallon vessel, I'd recommend a blow-off tube. When I checked on it again late in the day, there was a thin layer of yeast inside the replacement airlock, which had been clean beforehand. I replaced the airlock yet again at 11pm to hopefully protect against further blow-off of yeast. Update 06/16/2017: Earlier in the week, I put a fermwrap heater around the fermenter and set the temperature control to 73F. The yeast picked up its activity. For the last couple of days there has been no airlock activity, so I suspect the beer has fermented out. I'll be putting gelatin finings in it soon and moving it to my mini-fridge when I pull the Rhinegeist Truth IPA clone out of it. Although I did have to substitute some Hallertau Mittelfrueh for the Hallertau Hersbrucker the recipe called for, all the other ingredients used were exactly as the recipe called for. My post-sparge volume was about a quart low, so I added a quart to the kettle before the boil. Pre-boil gravity and original gravity came up lower than expected for this batch. I'm not sure yet how to account for that. Regardless, I think the beer will turn out well. The yeast pitched in this batch was grown from a single package of Wyeast 3787 purchased back in March and cultivated up to approximately 3 times the original amount. Two-thirds of the cultivation was pitched in this batch. Temperature control was setup to hold the beer in a 64-70F temperature range. Given the ambient temperature of 68F, realistically it will stay within the 68-70F range called for in the BYO recipe. Update 06/25/2017: The beer was dosed with gelatin finings on 6/21/2017 and has spent four days in my mini-fridge getting clear. I settled on a carbonation level of 3.4-3.4 volumes of CO2, which BeerSmith calculated to require about 6.25 ounces by weight of corn sugar. While I sanitized bottles, the bottling bucket, etc., my wife boiled a half cup of water and dissolved the sugar into it. I sanitized a dozen bomber-sized bottles and filled the rest of my bottle tree with 12-ounce bottles. I placed the bottles in my "hot box" with the thermostat set to 74F, and moved the last batch of bottles out of it. Around the fourth of July, we'll see how the beer turned out. Bottling yielded 12 bomber sized (22 ounce) bottles and 28 smaller 12-ounce bottles. Blow-off tube: Despite at least a gallon and a half of head space in the fermenter, the yeast was able to blow out through (and fill) the airlock and then coat about half the lid of the fermenter. Next time it would be smarter to use a blow-off tube and avoid the risk of contamination or an explosive blow-out of the airlock and the mess associated with it. I've found that Wyeast 3787 is a pretty aggressive fermenter, even with temperature control. A few samples taken from the fermenter for gravity checks had a nice flavor, so I'm hopeful this will turn out well and be a beer I brew again in the future. They're very similar beers, but it's easy to tell they aren't the same. The clone is more cloudy than the original. Gelatin finings should have corrected this, but did not. Perhaps I didn't use them correctly or give it long enough in the fridge. Both beers have trouble holding a head, with the actual beer having a tougher time. The real beer's aroma is more yeasty, and what I would associate with the White Labs Bastogne yeast. It's spicy or herbal sort of yeast aroma. The clone's was more clean. Color on the two was comparable, with the actual beer being slightly darker. Orange and ginger come through more in the clone than the actual beer. The actual beer is a little more full-bodied and sweeter, the clone is slightly thinner and a little more dry. The actual beer has a cleaner finish. Use gelatin finings with an extended refrigeration time until it clears. Despite all the above, the flavor of the two beers isn't radically different. It took almost a full glass of each for us to pick out all the differences listed above.